Icy white blooms with bold raspberry-red stripes and apple-green throats. 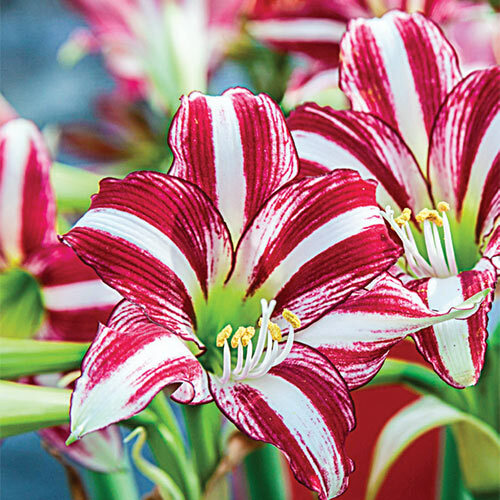 Holland's finest Dutch amaryllis produces spectacular, breathtaking beauty that must be seen to be believed. Blooms over 7" across. Jumbo-size 34-36 cm bulbs will produce 3 huge stems, each with 4-5 flowers. Complete instructions with each order and directions for plant care to ensure repeat blooming in successive years. 34-36 cm bulbs unless listed below. Funnel shaped with large perianths. Flowers are smallish, approx. 5" in diameter, but striking!